A cyclist has suffered serious injuries he was knocked off his bike by a car being pursued by police. 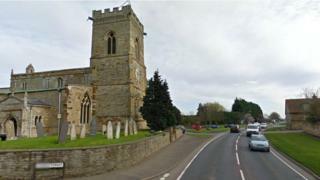 The collision happened at about 09:00 BST on Thursday on the A509 in Isham, Northamptonshire. Northamptonshire Police said that as the crash happened during a pursuit, the matter had been referred to the Independent Office for Police Conduct. Several road closures were put in place by the police and remained in place into Thursday afternoon. The cyclist has been taken to University Hospital Coventry.